If you head west and just a little south of Washington, D.C., and if you make it all the way to the coast, you’ll find Deale, a quiet village where the main occupations are fishing and recreational boating. The town has plenty of marinas and private docks to go around, and it’s far away enough from Washington and Annapolis that the waters don’t get too crowded on evenings and weekends. Still, Deale does have a bit of a problem: much of the town sits in Chesapeake Bay’s 100 year floodplain, which means these homes could be in danger during a strong spring melt. And even without a major flood, any basements or crawlspaces in the area may suffer water damage from the rising water table if they aren’t properly equipped to handle it. That’s what makes mold remediation in Deale an important topic. Water is sometimes known as the Universal Solvent. Chemists gave water that second name because more chemicals and compounds dissolve in water than in any other liquid. As it turns out, this includes the cement that holds concrete together. Concrete can hold up for decades if it’s properly cured and waterproofed, but when a concrete basement or foundation gets hit by floodwaters, that lifespan will fall in a hurry. Water is also the Great Lifegiver. Life on Earth is impossible without water, and there’s no two ways about it. Not every creature needs the same amount of water, however. Humans may need eight glasses per day, but insects and mold can get by on nothing more than the humidity condensing on a cold pipe. And if floodwater or a rising water table manages to sneak into a basement or a crawlspace, mold can start to take over. Beyond all the dirt and pollution brought in by the flood itself, a mold outbreak is bad news for several reasons. First, the musty smell would be overwhelming. Second, black mold spores would ruin the indoor air pollution by causing allergic reactions in everyone who stayed in the house. Third, the mold would be able to infiltrate the wooden beams and carpets exposed to the water, and it might even enter the concrete itself, weakening it. All of these things can also happen even without a flood, although the spread of mold would slow down based on how much water was available. Either way, once mold gets bad, it’s time to find someone to perform a mold remediation in Deale. AA Action Waterproofing can provide mold remediation in Deale, Shady Side, Annapolis, and any other location in Maryland. We also serve D.C., parts of Virginia, Pennsylvania, Delaware, and New Jersey. To conduct a mold remediation in Deale or elsewhere, we first waterproof the basement or crawlspace so that the mold won’t be able to use it to grow. In many coastal towns with a high water table, it’s a good idea to install a sump pump, which keeps water away from the basement floor by pumping it out and draining it away. The humid Chesapeake air can also cause problems on its own, and so it’s a good idea to install a dehumidifier near where mold tends to grow. 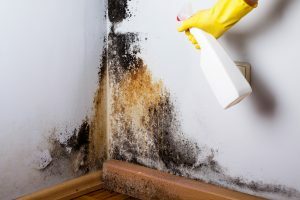 After that, mold remediation is a matter of isolating the affected area to keep the spores from spreading, washing all the surfaces in powerful cleaning solutions, and removing everything that’s too far gone. We can then replace whatever needs replacing, including the carpet, parts of the wooden walls, drywall panels, insulation, and sections of concrete cut out of the rest. We can even replace the entire foundation if that turns out to be necessary. Of course, not every mold remediation in Deale needs to be a professional job. If the damage is only on the surface and you don’t need to pull down half a wall to get to the mold outbreak, it’s very likely you could do it yourself. You might also get a better price than what we quote from one of our competitors, although you should also make sure they also have a positive record. Either way, that’s why our first estimate is always free and comes with no obligation. At AA Action Waterproofing, we want you to know what you’re getting before you pay for it.